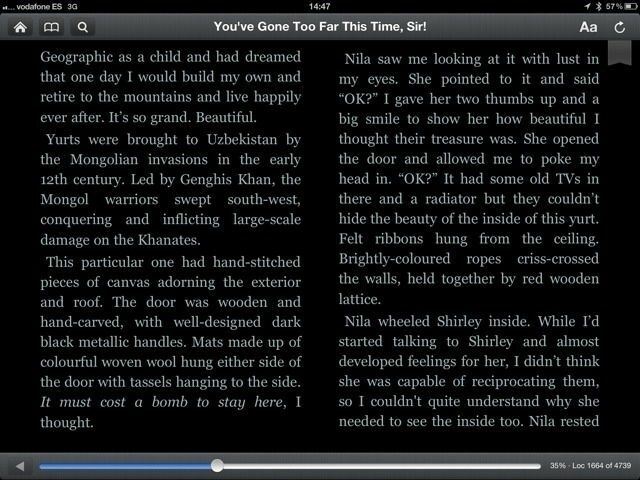 Apparently, ebook buyers don't care about typography or design. Amazon is now selling more electronic books than all paper books combined – in the UK at least. The Kindle went on sale in Blighty just two years ago, and now “Amazon.co.uk customers are now purchasing more Kindle books than all printed books – hardcover and paperback – combined,” says Amazon PR. And of course the Kindle itself is far from the whole story. The Kindle’s presence on pretty much every device ever, including the iPhone and iPad, makes the Kindle store a much more compelling place to buy books that the iBooks Store, whose offerings will only work on Apple devices. And it doesn’t hurt that it’s trivially easy to strip the DRM from Kindle books, making people like me a lot happier buying them. Despite the protestations of the book-snffers, e-books are clearly the best way to read novels and other texts. And Amazon’s press release contains some other rather surprising figures. For instance, this year Amazon.co.uk has sold 114 ebooks for every print book, and since the Kindle was made officially available in the UK (it could be previously bought from the U.S), book sales have quadrupled: “In the UK, we have seen that Kindle readers buy 4x the number of books they did prior to owning a Kindle,” says the press release. I switched over to Kindle-only years ago, although anything but beach and poolside reading gets done on my iPad in iBooks (after converting the Kindle books to EPUB so I don’t have to use the fugly iPad Kindle app). That’s not to say I don’t still like and visit brick-and-mortar book stores. I go regularly in fact – after all they’re one of the few places left on the high street that have free (and clean) toilet facilities.